Celebrating the rebuild of remote infrastructure in Nepal! 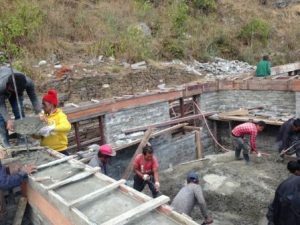 It has been the year of rebuilding remote village infrastructure following the devastating earthquakes in 2015. NAFA allocated $448,000 to earthquake related projects in five districts of Nepal: Dhading (Tawal, Kutal, Ladap and Richet), Solu Khumbu (Kophu), Okhaldhunga (Patale and Dhurpisurki), Dolakha (Shyama) and Sindulpulchowk (Jitpur). 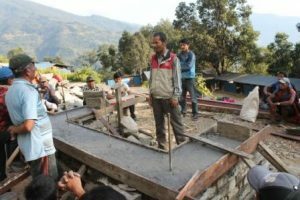 Additionally NAFA allocated $27,000 for earthquake training and for two engineers to oversee construction in eastern Nepal and in the Ri VDC, Dhading District. Infrastructure rebuilt or substantially repaired includes 40 classrooms in nine remote villages (located in five districts), agricultural cooperative infrastructure for farming households from four villages, and a gabion wall aimed at protecting a school and village from landslide risk. contracting two engineers for five months to live up in the rebuild areas to oversee construction of the first classroom blocks. hopefully prevent deaths from potential earthquakes in the future. Our overseeing engineers in the field are impressed with the high quality of construction. We hope to raise an additional $50,000 to complete the rebuild in 2017. 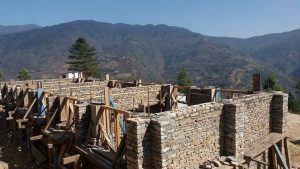 Allocations for NAFA’s rebuild/repair commitments in the Solu Khumbu, Okhaldunga, Dolakha and Sindulpulchowk districts have been made. Our focus now will be on completing the rebuild commitments in the four villages in the Dhading district.